What is it that pulls at the soul to saddle up and ride in the hills on a good horse? There is a universal peacefulness that appeals to those who ride. We all know that old quote from Churchill, “There’s something about the outside of a horse that’s good for the inside of a man,” or in many cases, a woman. AdaMae Rege was one of the founding members of the Redwood Empire Trail Riders which has been around since 1978. The club was founded by former members of the Cloverdale Riding Club, who disbanded when they lost access to their club arena (on private land.) 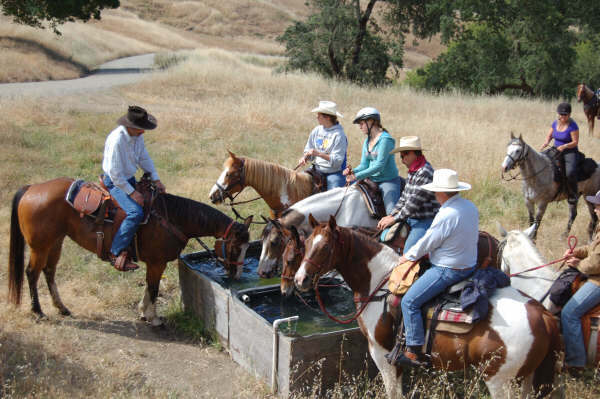 RETR’s annual June trail ride is now dedicated to her memory in honor of all enthusiasm she had for trail riding, and for her work to support the club. She truly loved trail riding. I think we all remember her riding her bay quarter horse, Tonto. Let’s honor AdaMae again by turning out for this 34th annual June ride, the weekend of the 8th through the 10th. She’ll be smiling down on us. This entry was posted in horse crazy, Horses, Ponies, Sonoma County, trail riding, Uncategorized. Bookmark the permalink.